Tickets to most India matches have been sold out,” Priyanka Saxena informed her colleagues. Her co-workers were huddled at her work station, eyes fixed on the monitor, hoping to get premium tickets for the India Vs Netherlands Cricket World Cup 2011 match in Delhi. “We were disappointed, but then we decided to go for the South Africa Vs West Indies tie, instead. I’m going to cheer for the South Africans as they haven’t won the World Cup yet,” she says. Cricket is an amazing game; it originated in Great Britain, but Commonwealth countries have adopted it as their own. The game has not only transcended international borders, it has also managed to cut across fault lines, transcending race, colour, caste, community, class and faith. 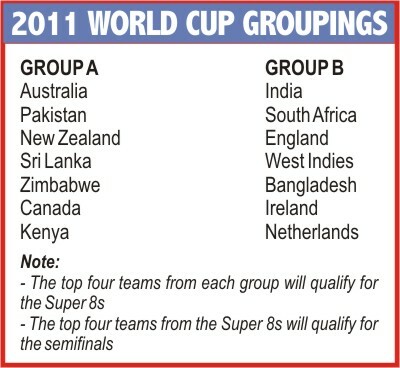 The 2011 Cricket World Cup is being hosted by three South Asian cricketing nations: India, Sri Lanka and Bangladesh. Teams from 14 countries are participating in the 10th edition of the World Cup. The event will be spread over two months and will be played in three different countries, starting off at the Sher-e-Bangla National Stadium in Mirpur, Dhaka, and ending in April at the Wankhede Stadium, Mumbai. “Sport brings communities together and helps release a lot of pent-up emotions,” says Ian Botham, former English cricketer. When you cheer for your country or any other favourite team of another country, you forget all your worries. If your team wins, it’s time to celebrate. Every time India or the team that’s being backed wins a crucial match, fans light crackers and distribute sweets; some dance to the beat of dhols. As a cricket-crazy country, we celebrate the success of Zaheer Khan and Yusuf Pathan, Harbhajan Singh and Dhoni, irrespective of their religious leanings. “People like to cheer for something; it’s a feel-good thing. If you are stressed, then watching a cricket match can bring relief; when your team wins, you feel on top of the world,” says former India cricketer Atul Wassan. World Cup is the time for bonhomie: It’s when you can start a conversation with strangers without inhibition, exchange notes and discuss the outcome of the match. When a batsman hits sixes, you might spontaneously hug a complete stranger standing next to you — your passion for the game takes precedence over age, gender, and community. “You can play cricket even in a remote village with just a bat and a tree stump for wickets. That’s what makes cricket popular,” explains Wassan. 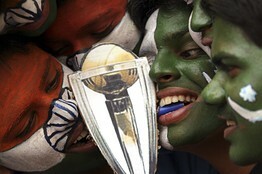 Devoted fans of the game cheer for their favourite cricketers irrespective of the country they represent. Interestingly, even if India is knocked out, people like to see their neighbours — Pakistan and Sri Lanka — do well and bring the World Cup back to the subcontinent. The result? Fans get to see ‘some good cricket.’ During the 1996 World Cup Quarter Final, in Bangalore, Aamir Sohail hit a delivery from bowler Venkatesh Prasad for four runs. He looked at Prasad and pointed his bat towards the boundary where the ball had gone. In the very next delivery, Prasad bowled out Sohail and pointed the finger towards the pavilion. “There is traditional rivalry between India and Pakistan. The armed forces of our respective countries may have to defend borders, but cricket is something that helps people-to-people bonding. During matches, the atmosphere on the field is electric, but after the match, the cricketers hang out together like old buddies,” says former India captain, Ajit Wadekar. And so do fans! A one-day match is played over six hours and sometimes players do get carried away and tempers run high. But cricket is a gentleman’s game and players have to abide by the umpire’s decisions. Often there is friendly banter on the cricket field and humourous one-liners are exchanged to help lighten the mood. For instance, Inzamam-ul-Haq reportedly told Brett Lee, a fast bowler, to “stop bowling offspinners”. In another instance, when Indian all-rounder Irfan Pathan came to bat, Afridi shouted twice: “O mera shehzada aaya!” — Oh! My prince has come. Fans adore cricketers. Those for whom cricket is religion, Sachin Tendulkar and VVS Laxman, are gods personified. The little master has such charisma and skills that Australian cricketer Matthew Hayden exclaimed: “I have seen God; he bats at no 4 for India in Tests,” referring to Sachin’s position in the Indian batting line up. “When people watch their favourite cricketers do well, it gives them self-belief. They think that if Kapil Dev or Dhoni can make it, they can also do well,” says former spin bowler Maninder Singh. Fans also manage websites dedicated to their favourite cricketers. A site called ‘Sachinism’ runs forum discussions based on Sachin’s knocks, and fans post their views on the master blaster’s innings. A game of cricket is a lot like life. Just like a batsman faces googlies from the bowler, we too have to deal with what life throws at us. The batsman stands alone on the field, faced with 11 opponents; but with training, discipline and good reflexes, he does the best he can. However, in the game of life we are rarely alone. We have family, friends and others willing to lend a hand. Moreover, we have the benefit of access to ancient and modern wisdom that helps us train and discipline ourselves to deal better with life’s challenges and help each other.